This version of our hugely popular KS90 engine has a unique and fascinating new linkage arrangement. This new linkage is known as a Ross Yoke, named after Andy Ross, its inventor. It allows both the piston and displacer to be connected on the same side end of the axle while at the same time maintaining the 90 degree offset between the piston and displacer. For larger engines it makes dramatically reduces the crank area. Ross yoke mechanism also often has stroke-multiplication meaning the crank-throw diameter can be shorter than the actual piston stroke. The yoke itself is attached to the crank and pivots on two precision flanged ball bearings. 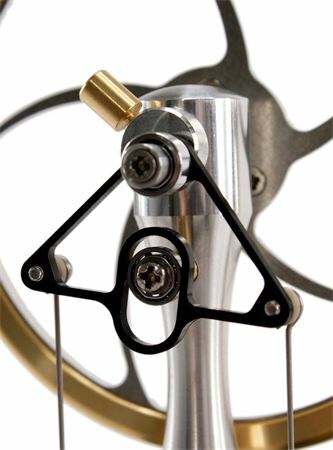 The oval section at the bottom of the yoke pivots on one precision ball bearing. All other specifications on this engine are identical to our KS90 model. 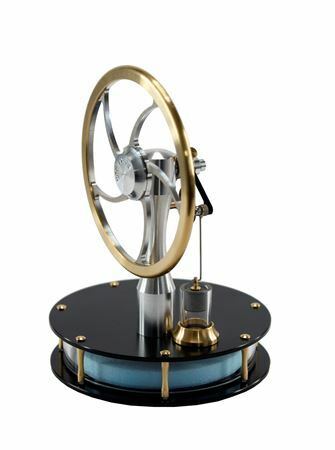 Stirling engines convert a small temperature difference into motion. As long as one plate is warmer (about 5°c) than the other then the engine will run. It doesn't matter which plate is warmer, as long as the other is cooler. If you reverse the temperature differential, and cool the plate that was warm, and warm the plate that was cool then the engine will run in reverse. The Stirling engine is named after its inventor, Rev. Robert Stirling, who patented his idea in 1816. Stirling engines work by cyclically heating and cooling the air inside the main chamber. As the air heats up it expands, and as it cools down it contracts. This expansion and contraction drives a small piston which in turn drives the flywheel. 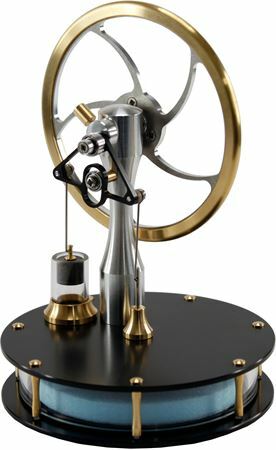 The clever thing about Stirling engines is that the mechanism for cycling the heating and cooling of the air is built into the engine in the form of the displacer, which is driven by the flywheel and moves the air from the warm side to the cool side and back again over and over. 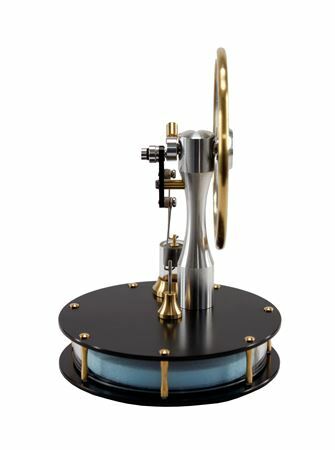 The Kontax KS90 Low Temperature Differential Stirling Engine is the ultimate eco-friendly device, showing with one spin of the flywheel a clean and simple way of converting waste heat into motion. Because these engines rely on a temperature difference for operation, they will run on almost any source of warmth. Typical heat sources include hot coffee or tea, warm sunlight, CRT monitor, TV digibox and the human hand. Because Stirling engines have a theoretical 40% greater efficiency than photo-voltaic (PV) panels worldwide energy companies are investigating using them as a way to provide energy in a more sustainable and environmentally friendly way. Such companies use our full range of low temperature engines to demonstrate the principles behind generating electricity using Stirling engines.